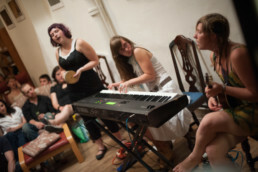 Gather together with neighbors to share in music and community. 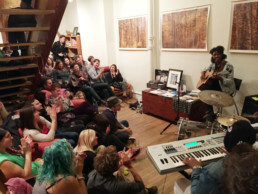 I’ve been hosting house concerts for over a decade in my home in West Philadelphia. Over that time, I’ve welcomed dozens of bands and hundreds of guests. It’s a pretty magical environment that’s evolved and I’d love to have you there. 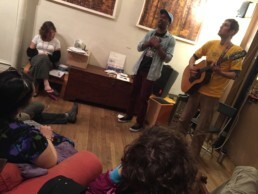 The house concerts are generally held at my home on the 4500 block of Osage in West Philly. Make sure to check the venue, as I occasionally host events at The Cedar Works, Studio 34, or Neighborhood House in Old City. Check Artful.ly for specific event details & RSVP. Please remember that this space is not a regular venue and does not have a dedicated event staff, so my housemates and I greatly appreciate your help in keeping things tidy and running smoothly. It’s two blocks from either the #42 bus or #34 trolley, and an 8 min walk from the 46th & Market El stop. If you’re driving, street parking is generally available within a few blocks. These are family-friendly inclusive community events. Friends/Neighbors/Youth/Elders/Anyone – all are welcome, with the note that the space is not 100% accessible and being able to climb some stairs is required. If you have specific questions or concerns, don’t hesitate to reach out. 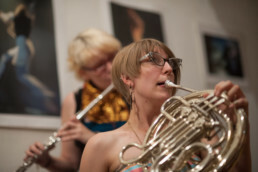 Contributions are encouraged to help support the musicians but no one is ever turned away for lack of funds. The biggest gift that you can bring is your presence. Please make sure to have friends RSVP if you are bringing them along. 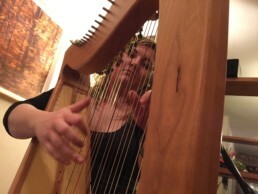 Yes send me invites for house concerts & other Philly-specific events! It’s great to be able to share a meal with our neighbors. 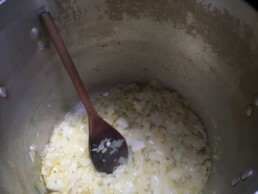 I generally prepare a large pot of lentil soup & some rice, so come hungry. It’s vegan, gluten-free, and the recipe is included at the bottom of this post. Hot cider on the stove provides a warm ambiance; I’ll also generally have some mulled wine & a few beers available for folks who are of age and consume alcohol responsibly. You’re also welcome to bring food & drink to share. As you meet new neighbors, I invite you to consider alternatives to the usual “What do you do?” question. 7pm to 7:45/8pm: Meet neighbors, get food & drink, claim the best seats. ~11pm: Concert wraps up. Another hour or two of neighborly hanging out may ensue as we clean up & move the furniture back into place. Please be respectful of the house and housemates, fellow guests and neighbors, and obviously keep it legal. Help clean as you go! When performances are in progress, please keep conversations to the front and back porches. When the rest of the audience is being perfectly silent, even a whispered conversation at the back of the house will carry and will be distracting for the rest of the audience. Just show up & bring your beautiful presence & attention! Help spread the word / bring a friend. Put some $ in the contribution jar. Support this series & the rest of my community & artistic practices by joining me as a backer. Be hospitable to the folks around you. Help welcome them, make a new friend. Tidy up as we go, to make for an easier cleanup. Stay late to help with end-of-night cleanup & furniture rearranging. Refer us musicians that might be a good fit for future shows. Q: Can you have [My Favorite Band] play one of your shows? By all means feel free to send them my way! Most of the great acts that have come our way have been through word of mouth. If you know a band that you’d like to see play one of my house concerts, send them a link to this page and invite them to get in touch with me if they think that it would be a good fit. Q: What's the deal? Is this a real venue? 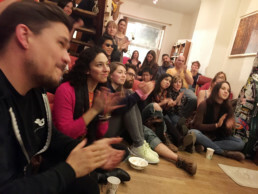 I’ve been hosting musical events for quite a while now, and this informal house concert series has developed quite a following. It’s a pretty special thing that XPN’s The Key has called ‘famed‘ & ‘celebrated‘; you can read a bit about it in this article. 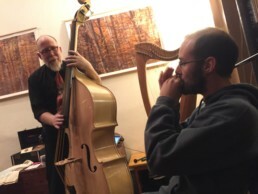 It’s an informal concert in a home; this makes for a powerful intimate experience, and also means that I can’t provide all of the amenities of a full-time music venue. I’ve got a small PA setup but most of our shows are acoustic, which feels a bit more intimate and right for the space. Q: Can I play on X date? While I’m happy to be in touch about scheduling shows, I only do these shows a few times a year, and so might not be able to accommodate your tour schedule. When we do shows, Fridays and Saturdays tend to work best, and we’re leaning towards Saturdays in general. Q: What is the space and crowd like? It’s a W. Philly row house that was renovated at some point to have a bit more of an open loft-style space. The concerts are generally well attended, with sixty to a hundred guests coming through over the course of the evening. 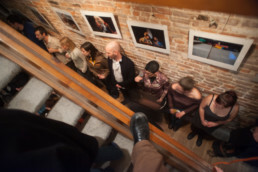 The crowd will be in front of you, at your feet, watching from above through the stairs and from a balcony level, and behind you in the kitchen. It’s all pretty informal and DIY. The crowd is generally warm and receptive. It’s pretty amazing when they all pack into the house and fall dead silent to listen to the music. These gatherings are listening parties rather than say having a band playing background music for a party. Q: What's the set order? Can I bring an opening act? We generally have 3 sets in an evening. Sometimes bands will be touring together, but often I’ll play matchmaker and piece together a lineup. The order of performances gets intuited based on what seems to make sense for a flow of the evening, and there’s not as much of a hierarchy as you might feel in some other music venues… the first slot may well have more people in attendance than the third, depending on logistics. The audience is going to be excited about all three sets, so the order doesn’t really matter. I’ve definitely seen a musician once come in kind of grumbly about realizing that their band was playing first, and then afterwards exclaiming that it was the best show they’d ever had in their life… no promises, but I’ll do my best to make it a good evening for you! Q: What's the compensation situation? These events are all sliding scale contribution based community events, and definitely not big money makers. Many of them have been taken on at a loss, supported by my business as ways to bring my community together. 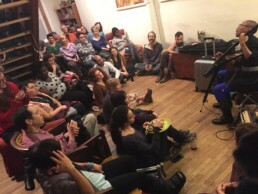 These shows are best either for new performers for whom audience building is valuable, or more established performers who want to get back to a good intimate and informal setting. If you’re in the middle stage of actively needing to get paid a certain amount, it might not work for you. That being said, we try to gather as much as possible in the way of contributions, and to give as much cash as possible to the artists. If you need a certain amount to make it worth your while, let me know and I’ll do my best to make it happen for you. 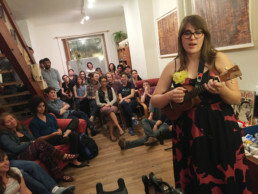 Q: How about housing for out-of-town performers? If you’re traveling through and need to place a crash, just let me know; we can often accommodate a few performers and there’s also neighbors nearby willing to host. Interested in playing a show?